The CC5MPXWD is similar to the CC5MPX, except it includes an internal defroster that prevents and removes light frost and icing from the camera's window. This high-resolution digital camera produces JPG images with a resolution of up to 5 megapixels, and shoots videos with a resolution of up to 720P. It has an integrated environmentally sealed enclosure that protects the camera from moisture and high humidity. An SD memory card for image storage is available as an option. The CC5MPXWD can function as a stand-alone camera or can be connected to a Campbell Scientific datalogger or another PakBus device. It has several options for image acquisition and storage. You can take still images or videos based on an internal timer, motion detection, or a trigger from an external PakBus device (such as a datalogger). The images or videos can then be stored on an SD card, saved in a datalogger’s memory, sent to a PC via email, or transmitted to an FTP server. 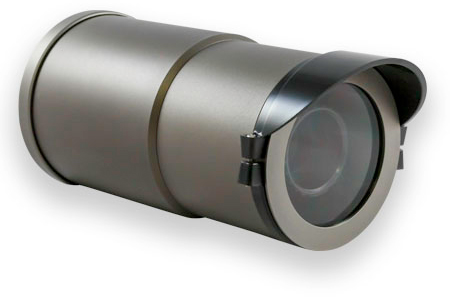 The CC5MPXWD's defroster consists of an aluminum ring with a resistive type heating element. Springs are used to press the defroster against the camera's window. The defroster turns on when the internal temperature is below a specified value and not in the low powered state. You can also specify the number of minutes before a self-timed schedule that the defroster will turn on. With extreme icing or riming conditions and low temperatures, the window defroster may not be able to clear the window due to the power constraints of the defroster. Operating at voltages greater than 16 Vdc can damage the camera. The 18549 Camera Mounting Kit is used to mount the CC5MPXWD camera to a CM202, CM204, or CM206 crossarm. The crossarm then attaches to a tripod, tower, or user-supplied pole (1.0-in. to 2.1-in. outer diameter). The bracket’s design facilitates the aiming of the camera. The CC5MPXWD is compatible with any PakBus data logger that has 2 MB or greater of on-board memory. The data logger must have a current operating system. Current CC5MPX Camera Operating System. Note: Once the update is downloaded, unzip the "CC5MPX_FW_1_25.gz" file. Save file to the desired location. Do not uncompress the "CC5MPX_FW_1_25.gz" file. Send the file 'as is' to the camera. Note: In order for the CC5MPX to accept the PIC firmware the CC5MPX OS 1.23 or higher must be running in the camera. Retrieve the CC5MPX_PIC_UPDATE_V2_JUNE_17_2014.hex.gz firmware from the .zip file. Do not extract the firmware update file "CC5MPX_PIC_UPDATE_V2_JUNE_17_2014.hex.gz". This compressed file must be sent to the CC5MPX as a “.gz” file. Details related to updating firmware can be found in the CC5MPX manual. Does the FTP server on the CC5MPX ever close a connection initiated by a client? If so, how long is the connection kept open before the server closes it? The idle timeout on the FTP server is set for 15 minutes. If the server doesn’t see any communication from the client within 15 minutes, it will close the connection. What is the CC5MPXCBL2-L used for? The CC5MPXCBL2-L is an environmentally sealed Ethernet (RJ45) cable that provides access to the network functionalities of the CC5MPX family of cameras. This cable is used with a camera to do the following: send emails, transfer images via FTP (accessing either a web server or an optional internal SD memory card), synchronize with a network time server, or gain access to the camera’s configuration web page. The CC5MPXCBL2-L can also be used to connect the CC5MPX directly to an Ethernet port, such as a cellular modem or wireless router. In addition, Campbell Scientific recommends using this cable if the CC5MPX is mounted on a tall tower or in a location that is not easily accessible. Note: The camera’s internally served configuration web page is the only way to view the real-time streaming video that is used to manually zoom and focus the camera. Is there a fisheye lens option for the CC5MPX? The CC5MPX uses a standard C-Type mount lens. If a lens fits within the lens tube barrel, or if the camera will be used in an environment where the front lens tube barrel is unnecessary, other lenses, such as a zoom or fisheye may be used. Note: Use of an alternate lens may void the product warranty. Is it possible to retrieve images from a CC5MPX using a simple HTTP GET request? This may be possible. Contact Campbell Scientific for assistance with this. Is a CC5MPXCBL2-L cable necessary for use with a CC5MPX camera? This depends. Typically, most camera applications require an environmentally sealed cable, such as the CC5MPXCBL2-L, rather than a generic Ethernet cable. However, for indoor or temporary applications where the cable will not be exposed to weather elements, use a standard 10Base-T CAT5e Ethernet cable, such as pn 28900. Is there a cable option for the CC5MPX that can interface to a cellular modem? This is done by sending images via PakBus to a Campbell Scientific data logger with a cellular modem telemetry option. The cable that is used is the CC5MPXCBL1-L Power and I/O Cable, which provides power from the data logger, as well as an RS-232 or RS-485 connection. How can images from a CC5MPX be downloaded directly through the Ethernet port using a remote script rather than using a browser or LoggerNet? Images can be obtained from the CC5MPX’s Ethernet connection through either FTP or email. What kind of case or enclosure can the CC5MPX be housed in so that it can be submerged five meters in saltwater? Although the CC5MPX’s enclosure is weather resistant, it is not designed for underwater use. However, if a watertight enclosure is rated suitable for saltwater environments, and there is physical space for the CC5MPX within the enclosure, then the camera will function as designed. Note: Campbell Scientific does not offer any watertight enclosures rated suitable for saltwater environments. Is a data logger required for the CC5MPX to work? No. A data logger is not necessary if the CC5MPX will be used in a stand-alone mode. In essence, a camera that is used without a data logger is an IP web camera. The camera does, however, need access to a 9 to 30 Vdc power supply. How can a live feed be established from a CC5MPX on RTMC? Although the CC5MPX can’t stream live video directly into RTMC, it can transfer images via FTP to a webserver that RTMC has access to. Depending on the update frequency, the images can be updated at near real-time, as long as the CC5MPX and the webserver are configured to allow this. Embedding a live stream from the CC5MPX into an existing web page can be done using the Real Time Streaming Protocol (RTSP). Contact Campbell Scientific for details.